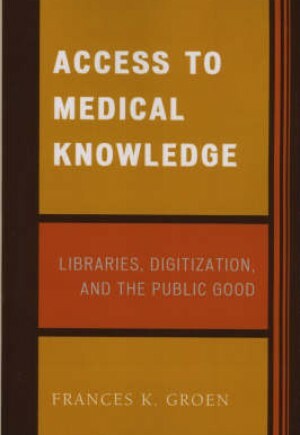 Access to Medical Knowledge answers the question, "What makes the medical librarian committed to the fundamental value of providing medical information to all who need it?" What are the underlying values of the profession that support this strong commitment to the public good? In answering these questions, author Frances Groen identifies three core professional values of librarians: providing access to information, preserving the accumulated knowledge of the past, and helping the public to understand how to help themselves to this information. While these values are shared by all library specialties, Groen explores their unique meaning within the field of medical librarianship by taking a careful look at its genesis through a thorough review of the literature demonstrating these perennial values in the practice of medical librarianship. The book describes the transformative nature of information technology that has provided new opportunities to revolutionize clinical medical information delivery and patient information, and it explores the impact of the digital revolution in providing a new paradigm for scientific communication and a more open approach to accessing the literature through the Open Access movement. Groen demonstrates the medical librarian's successful adaptation to this changing information paradigm while simultaneously adhering to the perennial values of the profession. Access to Medical Knowledge also addresses the need for intensified collaboration between branches of librarianship as a result of the digital library world bringing all library practitioners closer together. This book will interest all medical librarians because of its coverage of developments in international medical librarianship.